LARGE MAP OF NORTH CAROLINA. 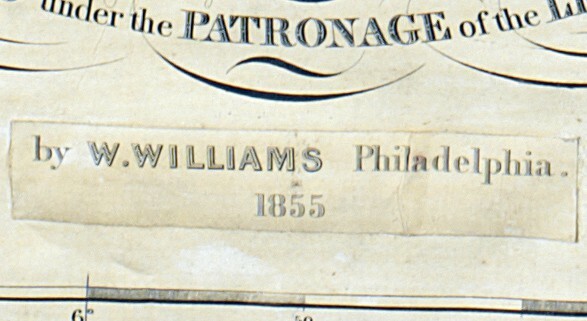 This was a very timely auction for Philadelphia publisher and engraver, Wellington Williams, the presumed purchaser of the plates. Just two months after the auction, three North Carolinians, Calvin Wiley, William Cooke, and Samuel Pearce, announced their intent to publish a new map of the State. 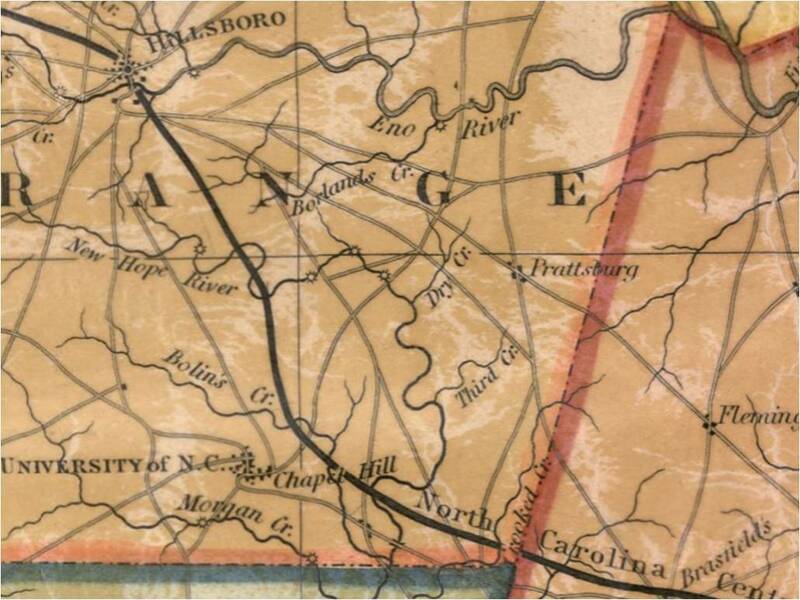 In 1854, using the MacRae-Brazier plates, Wellington Williams beat the North Carolinians to the market with A new map of the state of North Carolina : constructed from actual surveys, authentic public documents and private contributions. The subtitle concludes, Published under the patronage of the legislature. Well, yes, it was… over twenty years earlier! The engraved title for the 1833 map, including acknowledgement of the Legislature’s patronage, was not changed in 1854. 1854 edition of the MacRae-Brazier (uncredited) map by Wellington Williams. Williams did delete the publisher, cartographer, and engraver imprints below the title, and he added his own imprint below the neat line. A more appropriate title would have been, A slightly revised map... Williams’s revision to the plates was primarily one of addition. He added several counties that had been created since publication of the 1833 map, and he also added plank roads and railroads. However, he did not remove outdated or inaccurate information from the map. On the contrary, he contributed additional inaccuracies, including one example described previously on this blog. Another example, shown below, is the erroneous course of the NC Central Railroad curving towards Chapel Hill in Orange County. Its real course was several miles to the northeast, adjacent to Prattsburg. The railroad should curve upwards near Prattsburg, rather than downwards near Chapel Hill. This 1855 map is otherwise unchanged from the 1854 issue. Thus far, only one surviving copy of each has been located: 1854 in the Library of Congress, and 1855 in the British Library. Keep watch, map enthusiasts. The next sequel in this story, to be posted this summer, pertains to a most peculiar map. CORRECTION 6/24/2014: Another copy of the 1854 map has been located, thanks to the power of Google. The Huntington Library in Pasadena, California, has an incomplete copy. Despite the missing chunk from the western part of the State, this is an exciting find because it is a different state (earlier?) than the copy held by the LoC. A detailed analysis is pending, but the Huntington Library has confirmed that the railroad under construction extending southeast from Raleigh on the Library of Congress copy is absent on the Huntington Library copy. References: (1) The Pennsylvanian, September 24, 1842. (2) Philadelphia Inquirer, March 15, 1852. (3) Fayetteville Observer, September 25, 1854 (reprinted from the Raleigh Weekly Post). This entry was posted in 19th Century and tagged Calvin H. Wiley, CH Wiley, north carolina maps, Samuel Pearce, Wellington Williams, william d. cooke by crmaps. Bookmark the permalink.